Bracha was born in Poland in 1948 and arrived in Israel in 1957. She lived and studied in Tiberias, where even as a small child her artistic talents were apparent. She had already won her first art prize at the age of seven in Poland and throughout her public schooling in Tiberias she was known as the class artist. 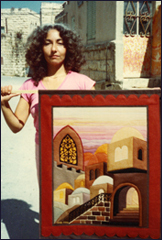 She continued to develop her talents, including music, and in 1970, following graduation from high school and the completion of military service, she enrolled in the Bezalel Art Academy in Jerusalem. There she met her future husband, Menachem Lavee, also a designer and artist. Menachem is a full partner in all of Bracha's projects. and discovered the flexibility of felt about forty years ago. The city of Jerusalem and stories from the Bible provide her with endless sources of inspiration. Her use of felt in bright, semi-tropical colors allows her to express her themes dramatically. They also allow her to capture both the warmth normally associated with tapestry and the attention to fine detail typical of painting. Bracha Lavee -Brym has produced a strikingly attractive and expressive new art form that is deeply rooted in the ancient and modern experiences of the Holy Land. While continuing to create new felt tapestries , mostly by special order, She has developed a line of wearable art, including purses and jackets. She has also published about a dozen editions of signed prints in different sizes. The themes of these prints include Bible, Israel, and Jerusalem. 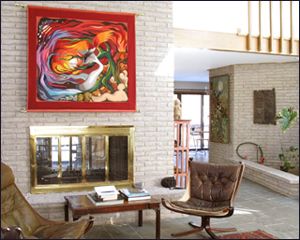 The prints are reproductions of Bracha’s felt works. Some are inscribed with quotations in English from the Bible that explain the significance of the art. All use the same vivid, semi-tropical colors and fluid lines that characterize Bracha's earlier work. However, while the felt works exude warmth, the prints shine: the liberal use of brilliant gold coloring makes her scenes of "Jerusalem of Gold" the jewelry worn by the heroines of the Bible, and other elements of these prints lustrous, energetic, and three-dimensional. It is clear from these works that, for Bracha, the Bible and the Holy Land are not just historical curiosities, but a vigorous and meaningful part of contemporary life. Bracha's works have been sold widely in Israel, North America, Western Europe, Australia, South Africa, and the Far East.